Dr. Suja Vathyam advises clients in the strategic preparation and prosecution of patent applications, particularly in the area of pharmaceuticals, chemicals, hair care, cosmetics, biotechnology, and food sciences. She has substantial experience counseling clients in worldwide development and management of commercially relevant patent portfolios, conducting infringement and validity analyses, drafting intellectual property licensing and joint development agreements, and conducting intellectual property due diligence in connection with mergers and acquisitions. Suja also has a strong background in patent litigation—particularly Hatch-Waxman ANDA litigation—and post-grant proceedings at the USPTO, including inter partes reviews and inter partes reexaminations. Prior to launching her legal career, Suja was a post-doctoral research chemist at Bell Labs and a Senior Licensing Manager at Lucent/Agere. Her licensing negotiations included complex transactions, which often revolved around patent licenses and sales, divestitures, joint developments, and technology licenses with both U.S. and international companies. 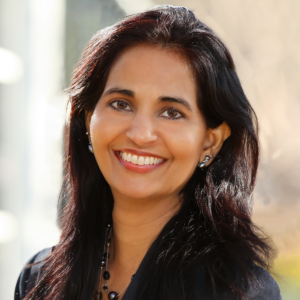 Suja is fluent in 3 Indian languages and enjoys cooking international vegetarian cuisine. Patent Law Basics For Chemists, presentation at American Chemical Society (ACS) Annual Meeting, August 2018. CLE Presentation at a major pharmaceutical company on Pharmaceutical and Biological Patent Strategies, May 2016. “Of rising importance: Pharmacokinetic patents in the US,” The Patent Lawyer, (September/October 2015), 17. “No more “Hand Me Downs” Please! : Children Deserve Medical Devices Specifically Designed for and Tested on Children” Spring, 2006; 58 Rutgers L. Rev. 719. Several articles published in peer-reviewed scientific journals, including Science.